Welcome to the official site of Get My Videos Back! Softpedia guarantees that Get My Videos Back 1.3.0.1 is 100% Free, which means it does not contain any form of malware, including but not limited to: spyware, viruses, trojans and backdoors. This software product was tested thoroughly and was found absolutely clean; therefore, it can be installed with no concern by any computer user.However, it should be noted that this product will be retested periodically and the award may be withdrawn, so you should check back occasionally and pay attention to the date of testing shown above. 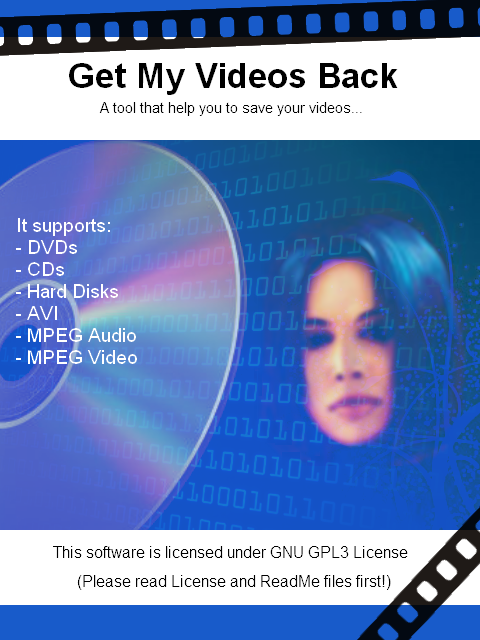 Get My Videos Back is a small and simple application specificly designed to help you save video or audio files from scratched CDs or DVDs quickly and easy. This tool has several different options and features to save your media files. Ever had that problem where Windows can't read a scratched or damnage disk? Yes... well this could be the very tool that saves that disc. Get My Videos Back (aka GMVB) automatically identifies the source media type, setting itself up for the best result possible. One of the features it includes is "byte mode" where you can read the source file from byte to byte. This might be helpfull if the source media has lots of small scratches. The "byte mode" may use a large amount of your systems resources and the restoring procedure will taking much longer. However it is more likely to recover those discs with the most damage. With GMVB you can save jobs and continue them later, using the previously restorefeature in this aplication. We cant guarentee it will save your files but it uses the latest technolgy and is your best chance of saving the media. GMVB also has a sector map that can help you to see the full progress of the restore procedure. You can see the count of errors and the skipped data size. The software also has a log file that that lets you know just what type of error could be on the disc. Design by Free Forum | Powered by WEngine | Page made by ThomAce | All rights reserved!